Successfully saved Mexican Meatballs with Tomato Avocado Salad to your Calendar. You can also save the ingredients to your Grocery List. 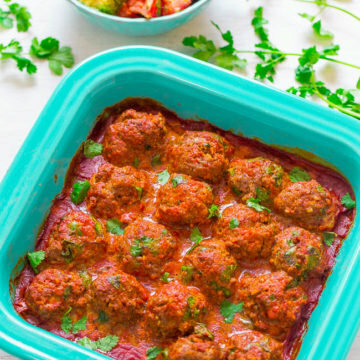 Mexican Meatballs with Tomato Avocado Salad – These fast and easy beef meatballs are coated in enchilada sauce and are loaded with Mexican-inspired flavors the whole family will LOVE!! Great for busy weeknight dinners or easy-breezy entertaining! !